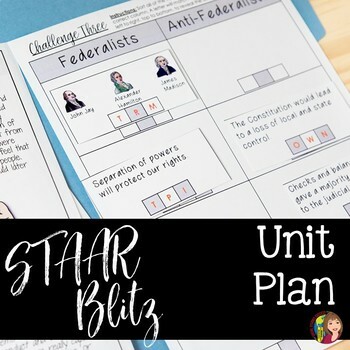 This is a comprehensive plan for 2 weeks of a US History STAAR review. If you do not have two weeks, you can choose the review activities that support a majority of the test (Constitution, Industrial Revolution), review thematically (people of US History, eras of US History), or that your personal data indicates is an area of weakness for your students. The Review is designed to intentionally review vocabulary on a consistent basis throughout the two week period – even if you only take 5 minutes a day, use the Word Wall terms to review important content vocabulary.